Vancouver is so beautiful on a sunny summer day that it’s hard to think about leaving it for an Alaska cruise. Passengers who embark on their cruise in Vancouver should seriously consider spending an extra day or two in this sprawling city of more than 600,000 people on Canada’s west coast. People who fly into Vancouver from the western half of the United States might be tempted to fly there in the morning in time to leave on an afternoon cruise. But the city has so much to offer that it’s a good idea to arrive the day before -- or two days before. There is that much to do. 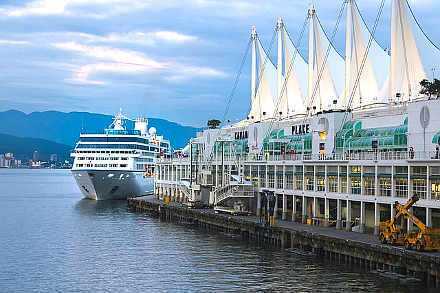 The Canada Place cruise terminal in Vancouver is the starting point for many Alaskan cruises. More than 800,000 cruise visitors every year either begin their voyages or stop in Vancouver on the Pacific coast of Canada, according to Port of Vancouver. Besides Alaska, the port also is the embarkation point for cruises to Hawaii, the Panama Canal, Asia, the South Pacific and California. Canada Place is in downtown Vancouver near shopping, restaurants, entertainment and attractions including the world-famous Stanley Park. What to do before the cruise depends on when passengers arrive in the city. Anyone who arrives the day of the cruise is likely to take a taxi or train to the Canada Place terminal. If they have a few hours available, Gastown is the place to go. The oddly named Gastown is a convenient shopping and dining district just a few blocks southeast of the terminal. A quick and convenient way to find things to do of any kind -- whether within walking distance or otherwise -- is the Tourism Vancouver office across the street from Canada Place. The phone number is (604) 683-2000. Waterfront Centre next to Canada Place is another popular first choice for cruise visitors who have a little extra time on their hands. This mini mall has a collection of shops, restaurants and services. FlyOver Canada is a unique entertainment experience at the cruise docks that uses state-of-the-art technology to make visitors feel as if they are flying. They hang suspended with dangling feet in front of a 20-metre spherical screen. The screen shows an eight-minute film that takes them from east to west across Canada. The experience includes special effects such as scents, wind and mist. The cost is $29 at the gate for adults with discounts for children, students, military and senior citizens. Beyond the cruise port area, visitors have many options for things to do depending on their interests. Some of the most interesting ones are Chinatown, False Creek, Granville Island Public Market, Yaletown and Stanley Park. Chinatown is the closest of the five major attractions at about one mile from the cruise terminal. Although it is sometimes touted as worth visiting for authentic Chinese culture, we found very little of interest other than the Dr. Sun Yat-Sen Classical Chinese Garden. Anyone who goes there and doesn’t mind walking can walk a half mile south to Science World TELUS World of Science, 1455 Quebec St. This science museum is worth seeing just for the architecture. The museum sits by the water at the end of False Creek. False Creek is a lengthy inlet lined with a broad, enjoyable boardwalk and series of small parks. It is about one and a half miles south of the cruise terminal. On a nice day, it is filled with walkers, joggers and cyclists. Likewise, the water is filled with boats including water taxis that take visitors over to Granville Island Public Market. From the boardwalk, we were astonished at the number of people we saw crowding the market across the water. So we hopped on one of the many water taxis streaming back and forth to take a closer look. The words “Public Market” in the name don’t reflect the true nature of the place. The market itself equals the best we have ever seen including the famous one in Seattle. The market is surrounded by restaurants, gift shops and galleries. Free entertainment is common. Yaletown lies right near the edge of False Creek. It is packed with restaurants offering a somewhat higher level of price and quality compared to Gastown. Anyone who likes recreation and has even more time available can go to Stanley Park. It lays claim as the first and largest urban park in the world. The park has 1,000 acres of rainforest, a beach, walking trails and other recreation. It also has Canada’s largest aquarium. The park is about 2.5 miles north of the cruise terminal, so a taxi or rental car is necessary to get there. Other major attractions in the area include Grouse Mountain and the Capilano Suspension Bridge. Grouse Mountain is a four-season resort with many activities available even for people who visit for just the day. Activities during the summer include a skyride, zip lines, mountain biking, paragliding and more. The facility is a 30-minute drive north of the cruise terminal. Capilano Suspension Bridge near Grouse Mountain attracts 800,000 visitors a year, according to its owner. The bridge is 460 feet long and hangs 230 feet above the Capilano River. TransLink, the Vancouver bus and subway system, has the SkyTrain subways that are a quick, easy and low-cost way to visit other sites in the city. Cruise passengers who fly into Vancouver International Airport can take the train from there to various points in the city including the Canada Place cruise terminal. After checking bags at the cruise terminal, it’s an easy matter to get back on SkyTrain for a quick visit elsewhere. Tickets are mostly less than $10 per person and depend on how many zones a traveler will cross. The TransLink bus system is a slower option with more stops than SkyTrain. It also serves the airport. Taxi companies also have guaranteed, flat fare rates that depend on zones. They are much more expensive than SkyTrain but offer more flexibility, especially for anyone with plenty of luggage. Unlike Alaska, Vancouver is quite dry throughout the Alaska cruise season from May through September. The average rainfall is about two inches per month, according to the Meteorological Service of Canada. It rains on average about 13 days in May, 11 in June and about seven days from July through September. The total rainfall and number of days with rain is less than half the total of the average cruise ports in Alaska. Vancouver may be the warmest and driest port of any port on the trip. Temperatures are mild throughout the summer with average highs in the low 70s Fahrenheit or about 22 Celsius. Nighttime lows drop into the mid 50s Fahrenheit or about 13 Celsius.